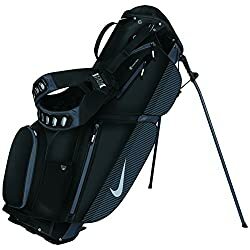 Of all the carry bags in the market now, the Nike Air Sport Stand Bag is gaining popularity especially with players who are in need of a lightweight carry bag along with a lot of storage space to make the game more enjoyable. When you look at this carry bag, it is very easy to conclude that it is very sturdily constructed bag and features Nike’s proprietary EquaFlex Max Air double strap system, which helps distributes bag weight evenly across the shoulders. So, for all our readers here’s an in-depth review of all the various aspects of this carry bag. One thing is guaranteed when you look at this bag – there is definitely no dearth of space. The Nike Air Sport carry bag comes with an eight-way, three-full length divider system for maximum club visibility. It has nine fully functional pockets to easily store your clubs, balls, outerwear, water bottles and personal items. Equipped with a water-resistant fleece-lined valuables pocket to store your valuable items like a pair of sunglasses, rangefinders etc and an insulated cooler pocket which can easily accommodate two bottles with ice. This bag is incredibly light weighted and we think this can be attributed to the fact that Nike has used its proprietary EquaFlex Max Air double strap system, which helps distributes bag weight evenly across the shoulders. The straps are easily adjustable and sit comfortably on your shoulders. Coupled with a ventilated air mesh back pad, the Nike Air Sport helps amplify endurance while reducing fatigue on the course. The bag overall weighs less than 5 pounds which definitely is a clear winner in this case. The materials used in manufacturing is solid and the bag is no doubt stylish. Comes in around 6 colors which makes gives users a variety to choose from and colors are suitable for male as well as female golfers. Out of 155 ratings given by consumers of this product, the average ratings on Amazon.com for this product was 4.7 out of 5 stars which is just awesome! Most of the users were happy with their purchase and have left awesome reviews on the quality, weight and storage. Many users have even commented that this might be the best carry bag that was ever used. Most of them felt that they bought a product which gave them complete bang for their buck!